So yeah, Saxon Scarf is looking pretty good. Until I held it up to my body and realized that it was turning out to be a tight knit. Hmm... I pondered. I checked the pattern. I'm working the size that will be 37" when all said and done. That sounded right at first. At least it did to my delusional brain. 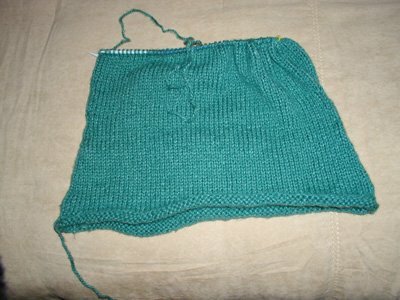 So I went to bed trying to convince myself that I knit the right size. I mean, I wear a 36 x bra. So 37" would fit me right???? RIGHT?? "Jumblies" ::laughing:: I WISH I had some jumblies to get over! I'm making my sweater at a size 40 so I think I'm going to have just the opposite problem.. but hoping that a nice hot water bath will shrink it just enough. 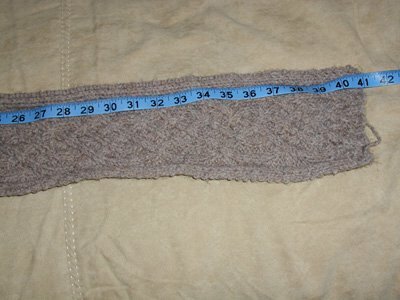 Well, I can't say I've ever had a problem with something not fitting over my 'jumblies', but I have had to completely rip out a sweater before. I feel your pain! I am in love with the Saxon Scarf. Where did you get the pattern (I hope I didn't overlook it on your blog). I just have to knit one! I wish my jumblies were as flat as pancakes! Your Saxon Scarf is fantastic. I am just about to put all my other knitting projects on hold and start that scarf myself. It's just beautiful. As for the "jumblies" well I have always had that love/hate thing going on with mine. When I was in my teens my grandmother told me that I would "grow into them" so that right there should tell you something. LOL. The "girls" are one reason why I don't knit myself sweaters.